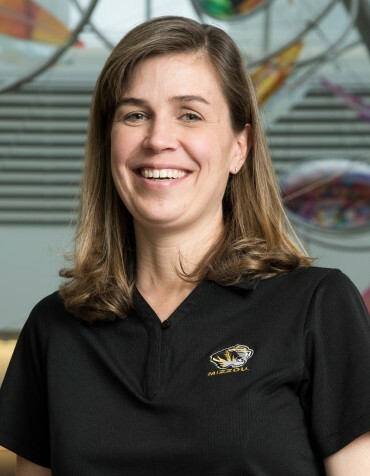 Melissa Goellner Mitchum is an associate professor of plant sciences and part of the Interdisciplinary Plant Group (IPG). The Mitchum lab studies the interactions that occur between nematodes and plants. Mitchum researches the soybean cyst nematode, a small parasitic roundworm that secretes effector proteins which mimic the soybean’s own, and thereby “tricks” the soybean plant into allowing the nematode to infect its roots. These nematodes use the effector proteins to transform normal root cells into specialized feeding cells where these obligate sedentary endoparasites feed for nearly thirty days to complete their life cycle. Her lab uses a variety of approaches and tools to decipher the function of the nematode’s effector proteins. Mitchum also is identifying the genes soybean uses to resist infection by soybean cyst nematode. A better understanding of the nematode and plant genes involved in the interaction could lead to the development of soybeans that are nematode resistant, which could reduce the more than 1 billion dollars in annual crop losses due to this pest. Systematic mutagenesis of serine hydroxymethyltransferase reveals an essential role in nematode resistance. Kandoth PK, Liu S, Prenger E, Ludwig A, Lakhssassi N, Heinz R, Zhou Z, Howland A, Gunther J, Warren S, Dhroso A, LaFayette P, Tucker D, Johnson S, Anderson J, Alaswad A, Cianzio SR, Parrott WA, Korkin D, Meksem K, Mitchum MG. Plant Physiology 2017; 175:1370-1380. Featured in this article: Pramod K. Kandoth, Melissa Goellner Mitchum.